Book Directly, it’s worth it!!! Save up to 10% on the best online rate!!! 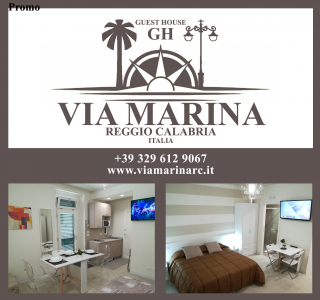 B&B Via Marina Reggio Calabria city center is a first class Bed and Breakfast located in the heart of Reggio Calabria, less than few seconds from the most important historical monuments such as the Museum, the Aragonese Castle, the Main Church, and the center of social life and tourist attractions. Only a few minutes from the door of B&B Via Marina Reggio Calabria city center there is the theater “Cilea”, the Court, the Corso Garibaldi which is the main shopping street, and, overall, the Via Marina named by the famous writer D’Annunzio as “the most beautiful kilometer in Italy” and the Museum of Magna Grecia, which houses the Riace Bronzes, and much more. Reggio is located on the “toe” of the Italian Peninsula and is separated from the island of Sicily by the Strait of Messina. It is situated on the slopes of the Aspromonte, a long, craggy mountain range that runs up through the centre of the region. The third economic centre of mainland Southern Italy, the city proper has a population of more than 200,000 inhabitants spread over 236 square kilometres (91 sq mi), while the fast-growing urban area numbers 260,000 inhabitants. About 560,000 people live in the metropolitan area, recognised in 2015 by Italian Republic as a metropolitan city. As a major functional pole in the region, it has strong historical, cultural and economic ties with the city of Messina, which lies across the strait in Sicily, forming a metro city of less than 1 million people. Reggio is the oldest city in the region, and despite its ancient foundation – Ρηγιον was an important and flourishing colony of Magna Graecia – it has a modern urban system, set up after the catastrophic earthquake on 28 December 1908, which destroyed most of the city. The region has been subject to earthquakes. It is a major economic centre for regional services and transport on the southern shores of the Mediterranean. Reggio, with Naples and Taranto, is home to one of the most important archaeological museums, the prestigious National Archaeological Museum of Magna Græcia, dedicated to Ancient Greece (which houses the Bronzes of Riace, rare example of Greek bronze sculpture, which became one of the symbols of the city). Reggio is the seat, since 1907, of the Archeological Superintendence of Bruttium and Lucania. 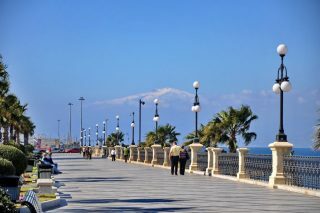 The city centre, consisting primarily of Liberty buildings, has a linear development along the coast with parallel streets, and the promenade is dotted with rare magnolias and exotic palms. Reggio has commonly used popular nicknames: The “city of Bronzes”, after the Bronzes of Riace that are testimonials of its Greek origins; the “city of bergamot”, which is exclusively cultivated in the region; and the “city of Fatamorgana”, an optical phenomenon visible in Italy only from the Reggio seaside.